Image © DC Comics. Written by Simon Spurrier, art by Bilquis Evely, colors by Mat Lopes, letters by Simon Bowland, cover by Jae Lee & June Chung. In my review of the first issue of this revamped series, I complained that the absence of the most important character, Dream himself, limited and harmed the series. Writer Simon Spurrier proves me wrong here, and also makes the absence of Dream in The Dreaming a major plot point, as Neil Gaiman did in the early issues of THE SANDMAN. Mervyn Pumpkinhead is the main character this time, and he has a lot to say. At first it seems like he’s talking to us, the readers, but when an off-camera gun is pointed at him, it becomes clear he’s talking to someone else, someone powerful, or at least well-armed. This is a narrative technique I haven’t seen used often in comics, and it worked really well to pull me into the story. 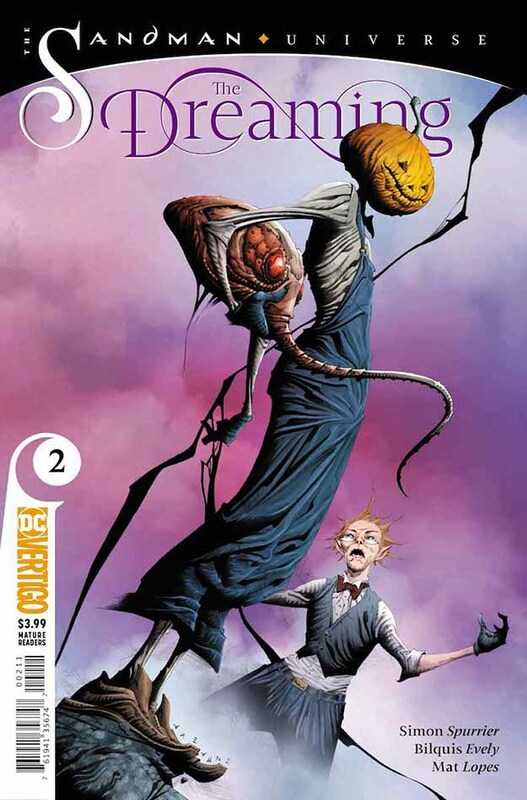 Merv was always one of my favorite Dreaming residents, and Spurrier does an excellent job with his dialogue and attitude, a grouchy passive-aggressive mixture with unconscious humor and funny word-mangling that’s not easy to do. Merv’s narrative is about how everything is falling apart, barriers are weakening, dreamers are becoming powerful disruptors of The Dreaming, new characters like Dora have too much power, and old ones like Lucien are struggling to keep up. Since Merv’s job in the realm is to fix broken things, he has a lot to complain about, and clearly he’s looking for help from the unseen character he’s talking to. Knowing Merv, that help may not be at all what he wants or needs. This is really a fine read. Highly recommended. This entry was posted in Comics, Reviews on October 15, 2018 by Todd.